Front focal display from last week. 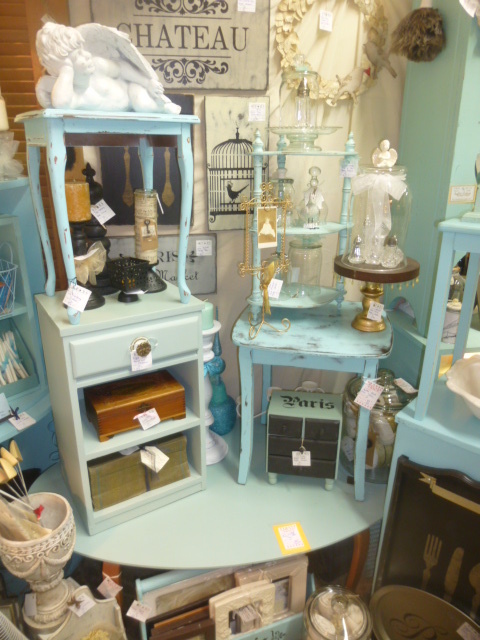 Since both of these two drop leaf tables sold in less than a, I really needed to completely re-do the front focal point of my booth. But I just wasn’t ready to scrap the ‘wedding dessert buffet’ theme just yet. 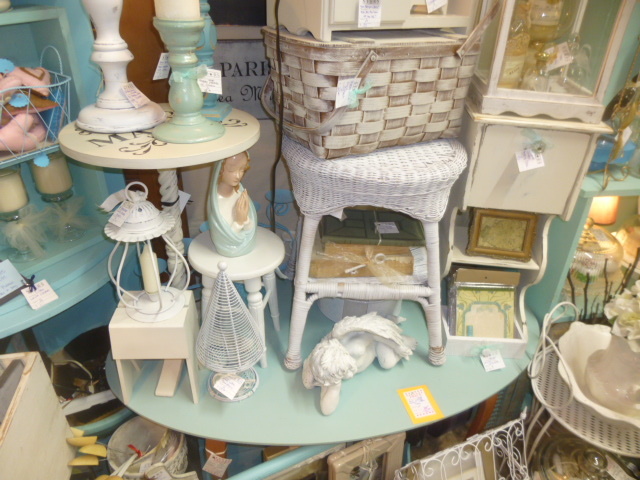 I’ve been trying to ‘segregate’ the white and aqua items, each color in their own little vignette for a more powerful visual impact, but I just didn’t HAVE any more white tables to replace these with so soon! Since I didn’t have any white tables to replace those that had sold in less than a week, in order to recreate the wedding dessert buffet theme; I had to intermix my aqua and white pieces. It’ll do for a while. The weatherman said “lots of sunshine in the 7 day forecast” so I should be able to get outside and get some more tables painted white. Did you notice this beauty surveying her kingdom in that previous picture??? This is the first in what I hope will become a series of one of a kind ‘art mannequins’; that I just made. She does have a pretty white post base. I just didn’t have room to display her where it was visible. 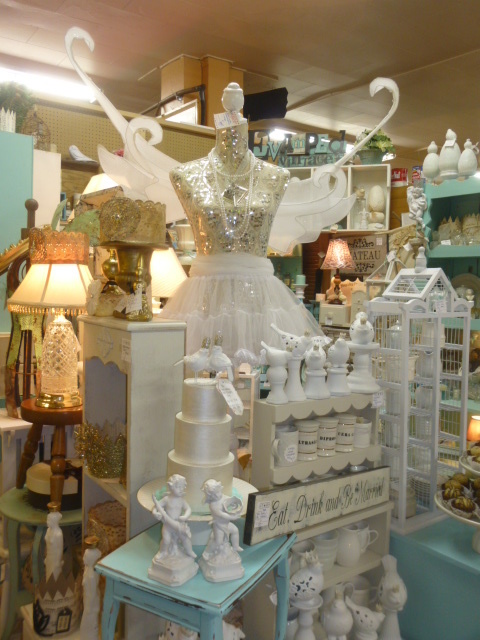 She is standing atop a bench just behind the front display. The base is adjustable in height and removable, making it easier to fit her in the car for transport. I had really hoped that you could see her silver necklace better in this picture. It’s a little silver frame with a silver key hanging from it and a pewter color heart tied to the key; all hanging from a grey sheer ribbon. And she had to have strands of pearls, of course! 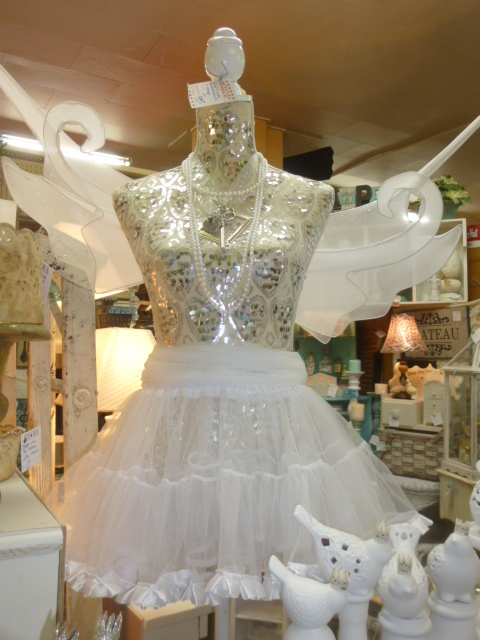 You can better see her whispy white ‘faerie-like’ wings in this picture; that match her little frilly white skirt. What do you think of her??? 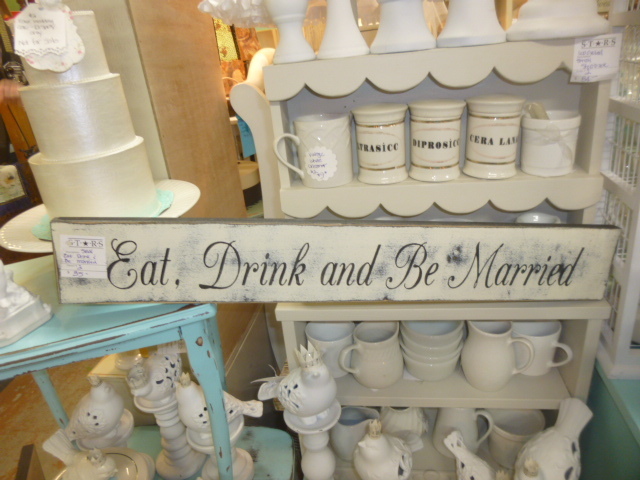 Perfect sign for a wedding dessert buffet. And I remembered to add the sign to the display this time! And the white birds decided to join in the festivities. 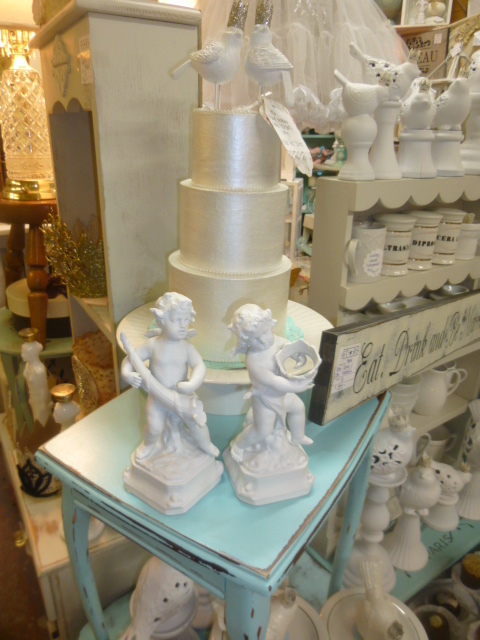 A couple of porcelain cherubs stand guard over the wedding cake. 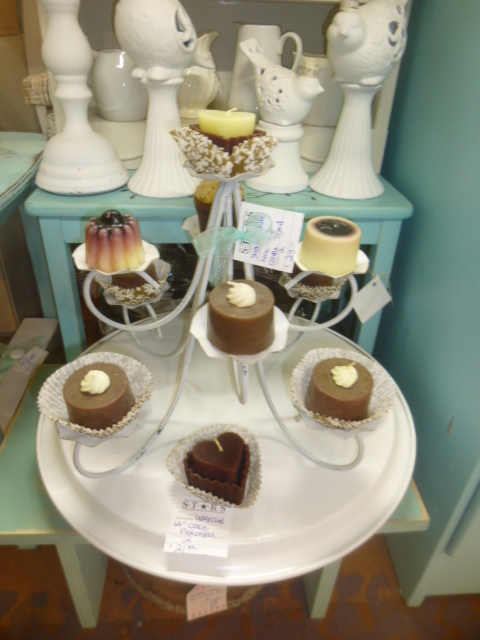 A vintage metal tea light candle holder sits atop an over-sized, upcycled metal cake stand as an impromptu cupcake display. 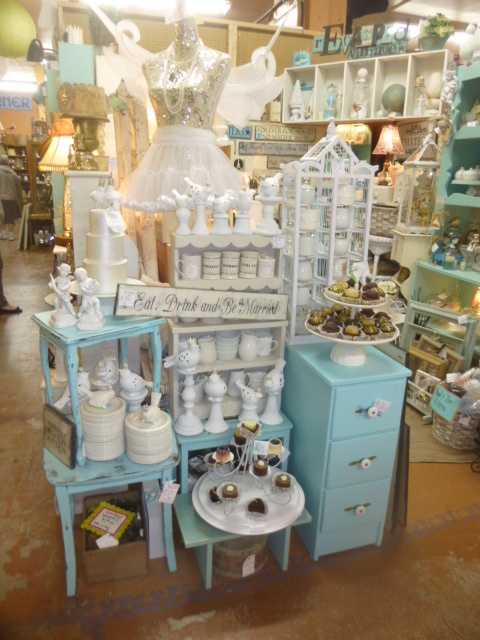 White and aqua combined display in the back corner. 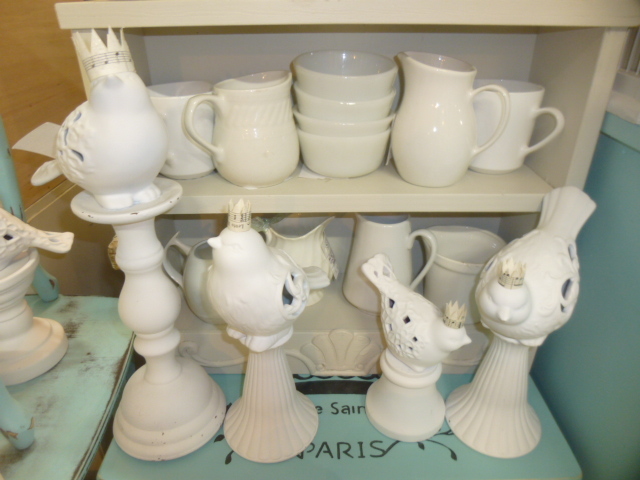 Because I had to pull the aqua tables to the front display, I had to move some existing white pieces and place a few new white pieces in what had been the ‘all aqua’ corner of the booth last week. This little ‘chest’ atop the picnic basket is a new addition too. $35.00. 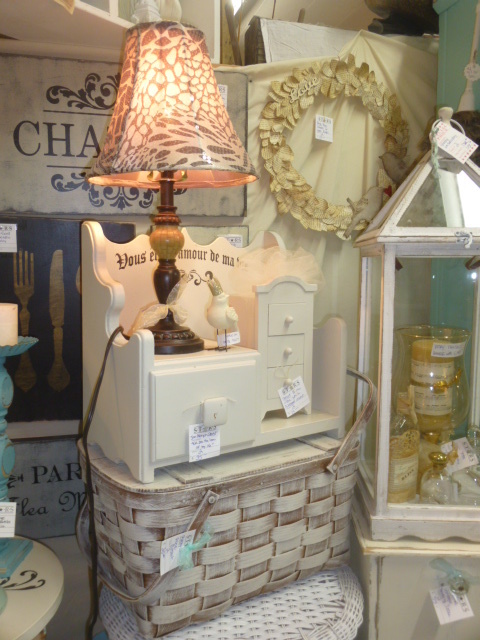 Love how the little three drawer chest fit into the cubby on the right! I’m guessing that this was probably a cook book stand and the drawer for recipe cards? This same spot last week. This spot previously housed all those white birds on pedestals that are now at the wedding buffet. I like the contrast of the black pieces on this white shelf MUCH better. 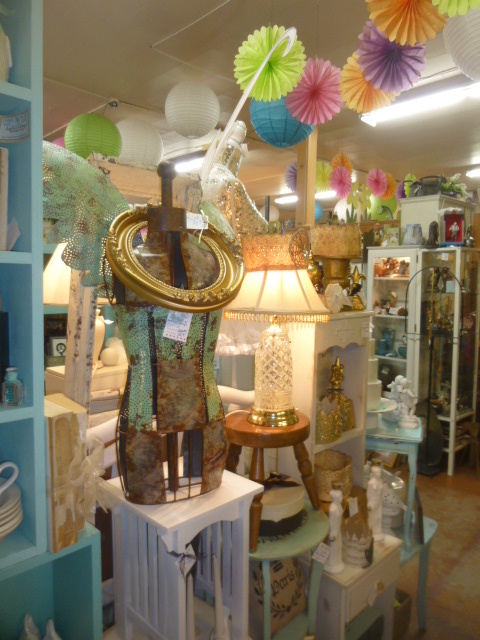 Upcycled metal table top mannequin. 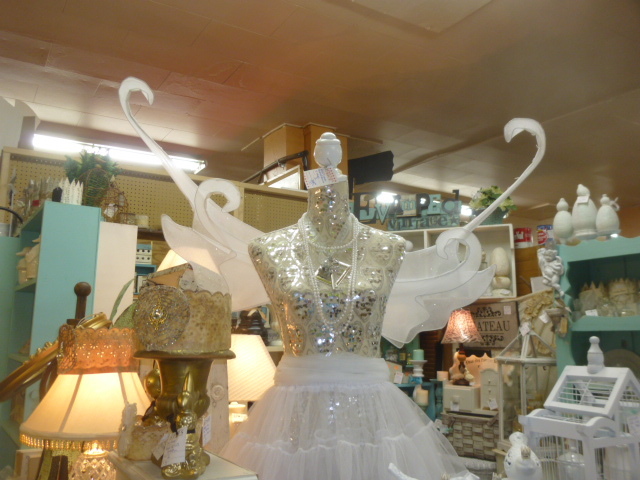 I almost forgot about the silver and white mannequin’s little friend here! 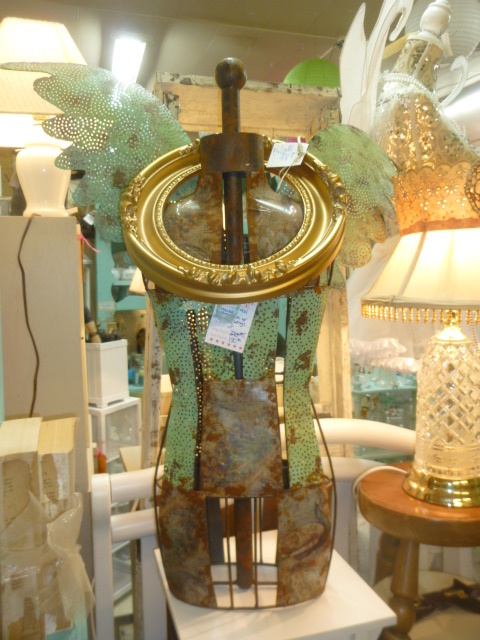 She is a ‘table top’ style (no stand) of upcycled rusty and verdigris metal scraps with lace punched green verdigris wings; which are removable for easy transport. 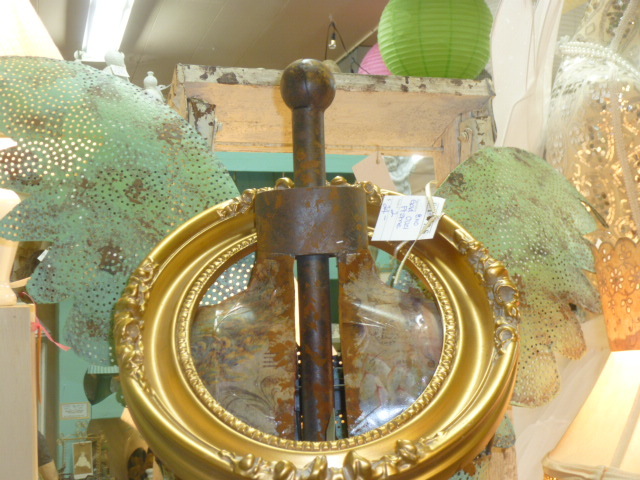 This lovely is $190.00. The oval gold frame around her neck is sold separately. New white mini pie safe? Does this mini pie safe look familiar? It had been in my booths for months and gone unnoticed. 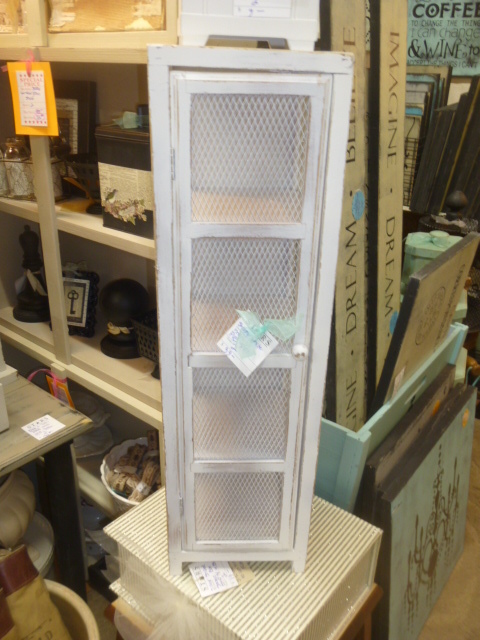 So I took it home for a pretty whiter make-over! $39.00. 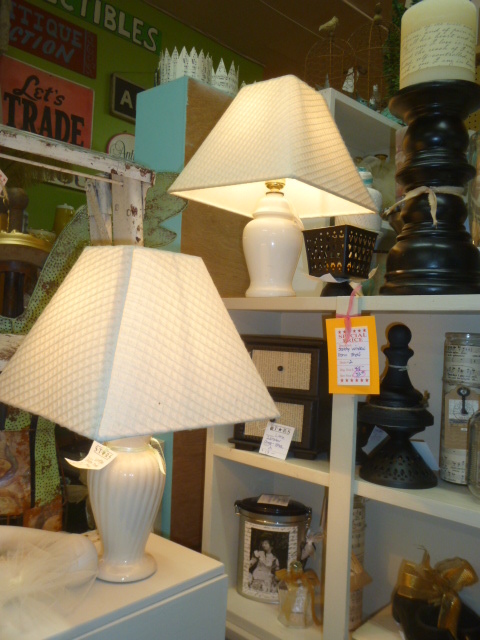 Added a few new lamps to brighten up the space. 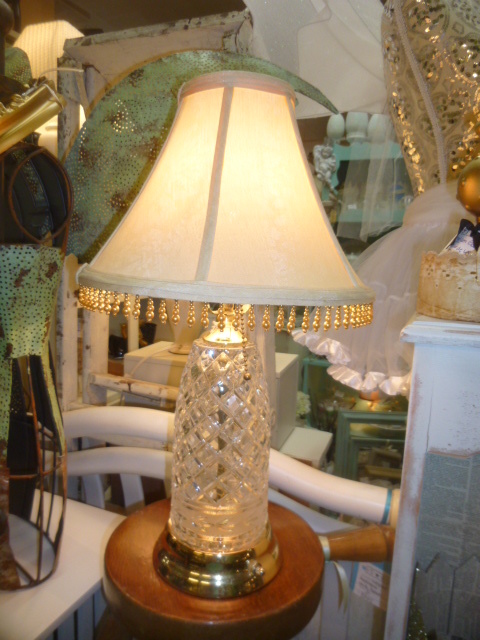 Vintage crystal lamps are always a good bet. They go well with so many different styles. So, that’s how the booth is looking this week. The road construction has finally made it’s way down the street a bit, so parking for Stars is once again plentiful and easy to access. Come by soon and meet the new ‘girls’! Love it! I could use several of those mini pie safes to display my jams at farmers market. I’m interested in that white dress form. What in the world is her neck and bodice made up with? It almost looks metallic and with hearts or something? Did you do that or did it come that way? Very striking! 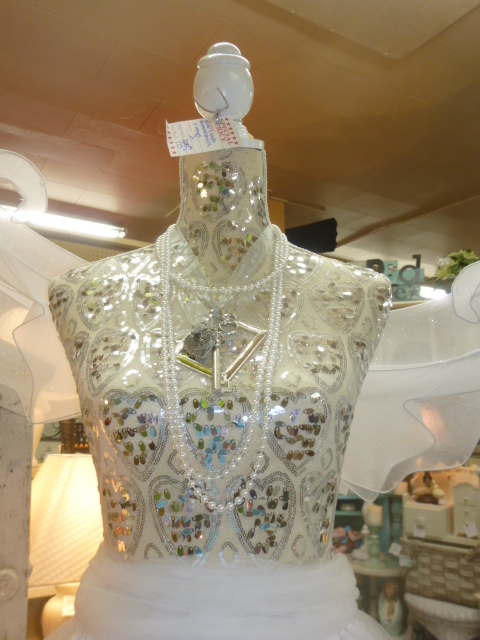 Patti, I bought the ‘basic mannequin’ with the sequins already sewn onto the fabric that covers what I believe to be a hard plastic body. 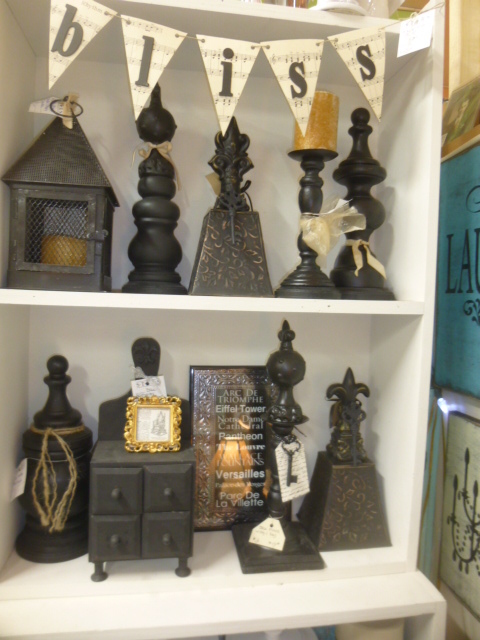 The finial on her neck ad the pedestal base are made of wood. (everything else I made and/or added) I wasn’t terribly fond of the silver sequins initially, because I had envisioned creating a more ‘shabby’ piece with tea stained fabrics and lace. But the basic mannequins are VERY hard to find AND afford! So I just had to get what I could find and GO for it. I love the mannequins! You did a wonderful job on them. And I know they are expensive if you can even find one that is in good enough shape to redo. 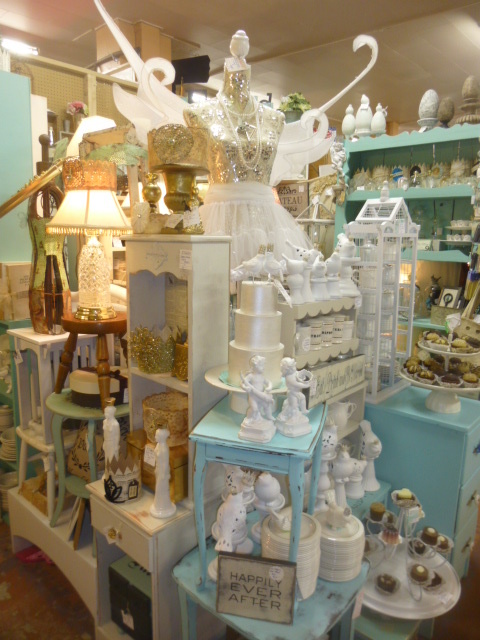 And I love the white and turquoise mixed together.I think that makes your booth look really nice. Keep up the good…no wait “GREAT” work!!! Love the look! 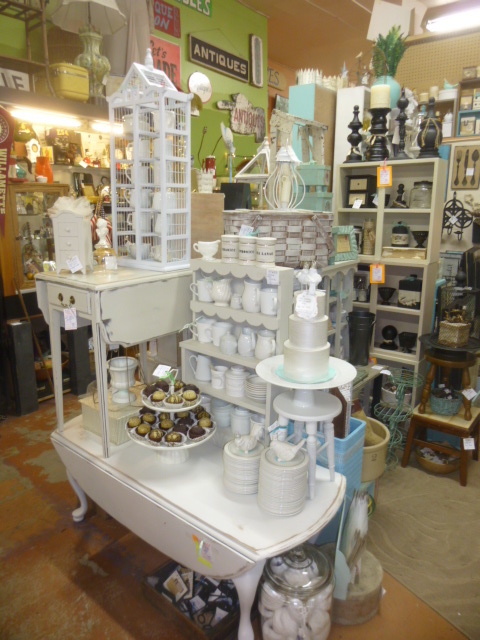 Have you considered moving the white smoking table to the front with your wedding display? It would be great for someone to buy to use for cards at the reception. 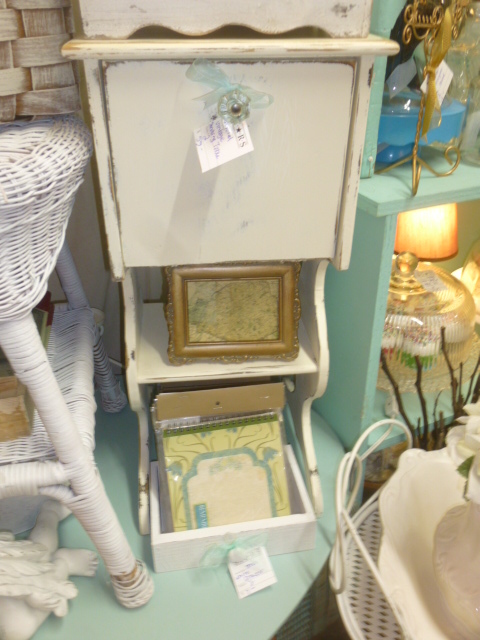 You could open it and put some of your handmade cards on display inside to hint at the idea…just a thought.